Royalty. Majesty. Creativity. These are just a few of the powerful meanings you might find hidden within the color purple. This rich hue rarely occurs in nature which has resulted in it being referred to as a sacred color and given an elevated status among the most elite members of society since the earliest times. Throughout history, only people of royalty and high authority wore purple robes. This was due to the rarity of purple dye and the high costs it took to make. In addition to its significance in royal history, since the early 1900s the United States Military has been awarding soldiers wounded in battle with a Purple Heart as a symbol of honor - yet another of its many powerful meanings. Although less naturally abundant than other colors, when purple does make an appearance in nature, most often among the beds of a flower garden or in the layers of a mesmerizing sunset, it's a breathtaking and inspirational sight worthy of pause. Purple is a color that has been held in high regard throughout history for its meaning, beauty, and rarity, and for those who love this vivid shade, purple lights are perfect for adding a richness and elegance to holiday and home decorating. Using purple lights to accent holidays is a bold and fascinating way to decorate. Purple lights can be used to decorate for Mardi Gras, Easter, Halloween, and Christmas as well as during birthday parties and special events. During Mardi Gras, purple is paired with gold and green, and for Easter it is often paired with bright pastel colors. For a unique spin on Christmas lights that's every bit as royal as it is fun, try pairing purple LED mini lights with cool white! The bright white really makes this rich eggplant hue pop & is gorgeous when accented with silver ornaments and decorations. The color purple is extraordinary considering it can be combined with so many different colors and still look amazing. Halloween is one of the most popular holidays for pairing purple with contrast colors. Purple, green and orange all come out to play during this spooky time of year! During October, purple takes center stage alongside shades of orange and green both in nature and in decorating. Not only are these some of the most beautiful foliage colors of fall, they are also the main hues haunting Halloween parties and decorations. When purple lights are paired with green and orange, something truly magical happens -- spooky decorations come alive and haunted houses take on an eerie glow. Like where this is going? Make your own spellbinding display with some of our Halloween decorating ideas below! Hang purple and orange icicle lights off your porch. Use a green laser light projector or a couple of smoke machines to make the scene look even more eerie. Decorate your front porch with purple, green, and orange LED starlight spheres to create a whimsical Halloween scene full of floating orbs. 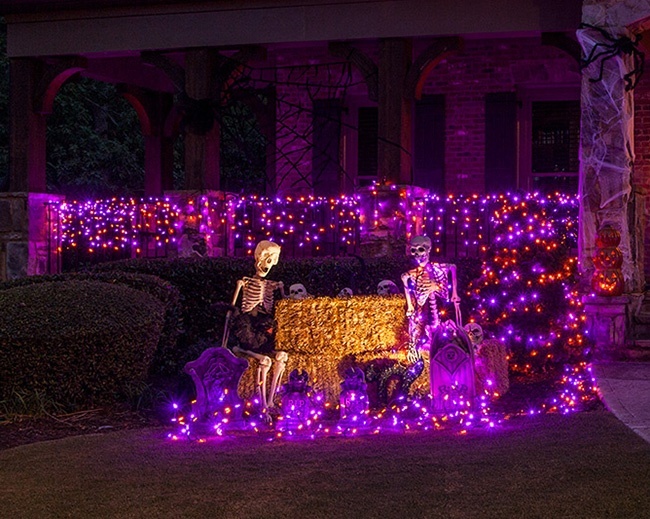 Wrap your bushes with purple and orange Halloween net lights for quick and easy outdoor lighting before trick-or-treaters show up. Extend your decor further into the yard by hanging ghostly figures, bats, spider webs or witches hats from tree branches and wrapping tree trunks with purple, orange and green LED mini lights. Line your driveway with purple and green C7 or C9 bulbs for a fun and festive Halloween that brings all the Trick-or-Treaters to your door. You might have noticed already that there are a variety of purple lights available in both incandescent and LED options. Deciding between these two light types often comes down to visual preference, budget, and the size of your display. LED lights allow for more strings to be plugged together on one power source, are incredibly durable and use significantly less energy, making them perfect for large scale and long term lighting displays. They are also available in a greater variety of bulb styles & sizes than incandescent versions, allowing for a wide range of decorative applications. 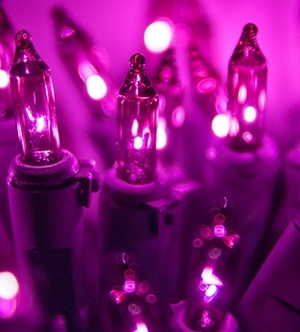 There are a lot of benefits to selecting purple LED lights for your project, however with these benefits also comes a higher price tag than with incandescent versions and this greater initial investment may not make sense for certain types of displays. 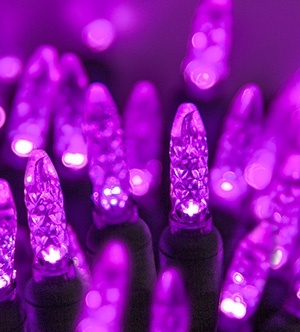 If you're only planning to use a few light strings periodically throughout the year or are on a budget, incandescent purple lights might be just what you need to get the job done. No matter which bulb type you choose, if you love purple, you have found your people! We have a large selection of purple bulbs, string lights and decorations available to make any design you can imagine a reality!